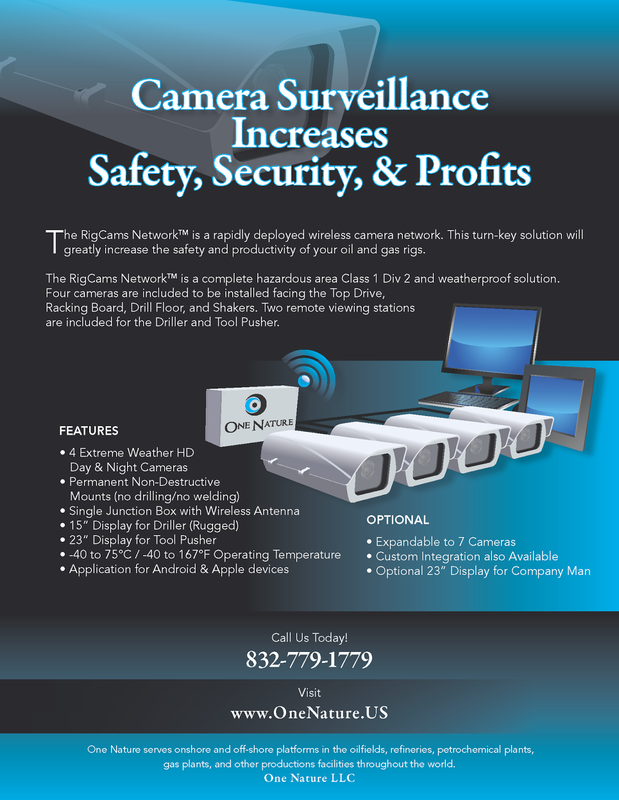 One Nature LLC presents to you our Featured Product, The RigCams Network. The RigCams Network is a rapidly deployed wireless camera network. This turn-key solution will greatly increase the safety and productivity of your oil and gas rigs. The RigCams Network is a complete hazardous area Class 1 Division 2 and weatherproof solution. Four cameras are included to be installed facing the Top Drive, Racking Board, Drill Floor, and Shakers. Two remote viewing stations are included for the Driller and Company Man. More details on the company’s oil rig security cameras and services are available from One Nature LLC online at http://www.safeworkplacesolutions.com/products/oil-rig-security-cameras.